This charming 600 square foot studio/loft is set above the main house garage with a private entrance. A comfortable king size bed, perfect for sleeping in a little later then usual. A full kitchen with all the amenities to prepare a great meal on the new LG gas stove. Kitchen also has a Large LG refrigerator with ice maker to keep those leftovers from spoiling and quartz countertops. The bathroom is Spa style with walk in shower which features a rain style shower head. A cozy sitting area which boasts a gas fireplace and 43" TV is also a great area for catching up on a good book. A walk in closet for longer stays, a new gas grill sits on a private deck which makes you feel like your in a tree house. Parking available for your off road vehicle. Dog friendly, nonsmoking please. Check in at 2pm (if later then 7pm arrangements can be made) Check out at 10AM. Air mattress is available for young children. A $300 refundable damage deposit is applied to your VRBO payment. **No reservations is guaranteed until paid in full. The Strawberry/Pine area has a lot to offer such as great hiking, Mountain biking, fun shops for antiquing, some great restaurants, and friendly people. Brian and I visited Strawberry many years ago and fell in love with the area and weather. Both grew up in the Seattle area then moved to Surprise AZ on a whim back in 2002. Decided to escape heat and ended up in Strawberry. We built our forever home and want to share this great area with others. 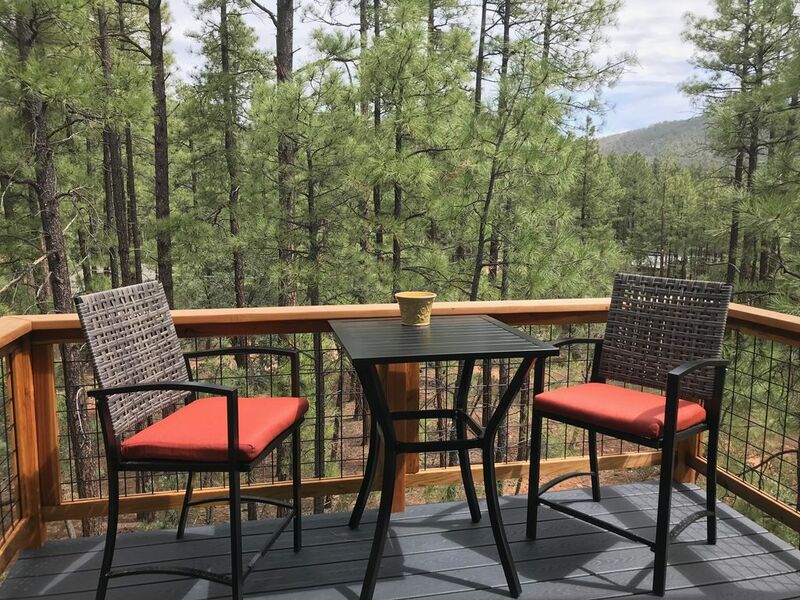 The property is located on top of a hill surrounded by ponderosa pines and abundant wildlife. We built this home knowing that we would be sharing this great area with others from the valley and farther places. The back yard is much like a Seattle landscape with the front yard left native. The Entrance to Emma's Loft is very private and extra care was taken to provide extra insulation for noise, heat and cooling. And our dog Ruckus loves the place. 1 full bathroom, shower only with rain style shower head. With Nest -Be sure to let me know what temps high/low. You can always open up at night to cool things down. Parking up past the garage next to the house or top of the hill. 12 cup coffee maker...coffee provided Folgers. Also a new Keurig with sample K-cups, or bring your favorites. We try to provide everything you might need to cook a great meal: Salt, pepper many popular condiments, spices, not to mention a variety of snacks and easy to prepare soups and deserts. gas range, full refrigerator with ice maker, under counter microwave, sorry no dishwasher. Lots of pots, pans, baking dishes, mixing bowls, plates and silverware. Lots of good hiking and mountain biking trails. Tonto Natural bridge is a must see. Pine offers many small mom and pop shops with unique items. Good restaurants and bars that offer live music on the weekends. Strawberry is a day trip away to Sedona. And the weather is unbeatable.